For the last several weeks, all I’ve seen on Pinterest and other sites are cute little bunnies. Sometimes with brightly colored eggs, sometimes with pastel Easter baskets, and sometimes, well, they’re just there looking cute and adorable. Obviously it’s close to Easter. And EVERYONE associates bunnies with Easter, right? Along with the colored Easter eggs, of course. And the marshmallow peeps…in all colors. But…it’s not about the bunnies. From what I’ve been able to determine, the legend of the Easter Bunny bringing eggs seems to have been brought to our country by settlers from southwestern Germany in the 1800’s. Since that time the Easter Bunny has gradually become the commercially recognized symbol of Easter. Folklore tells us the Easter Bunny brings baskets filled with colored eggs, candy, and sometimes even toys to children the night before Easter. Sometimes the baskets might be hidden, and the children have to go and find them. Most likely, that’s how the tradition of the Easter egg hunt began. But it’s still not about the bunnies. To those of us who are believers, Easter is about one thing. The resurrection of Jesus Christ. The very name of the holiday may have come from an ancient holiday depicting the rites of spring, or rebirth from the bleakness of winter, but to us, it represents much more than a rebirth of the world. Easter is a celebration of the eternal life we have when we accept Jesus as our Lord and savior. In fact, our belief in the resurrection is the very foundation of our faith. While Jesus was conducting his ministry on earth, He told His disciples what would happen to Him in order to fulfill the ancient scriptures, but of course, they really didn’t believe Him, and even tried to prevent it. Until they saw the truth for themselves. We have read about the agony of the crucifixion. We have seen it depicted in countless movies and plays, sometimes in such a gruesome manner we have to look away. But the real crucifixion was much more gruesome than can be portrayed in a movie or a play. And our Lord suffered the most horrific pain, so those of us who choose to love Him and call Him Lord will be eternally with Him in heaven, along with all of the others who believed the same. What a wonderful, unselfish, beautiful story. As wonderful as the Christmas story is, the Easter message is so much better. Because in this story, death is defeated for all time. The baby that was born at Christmas has grown up, became a man who is the son of God himself, and gave His very life to save ours, and has now defeated death itself. Multitudes saw Him die that day. They saw the lightning and heard the booming thunder when our Lord drew His last earthly breath. 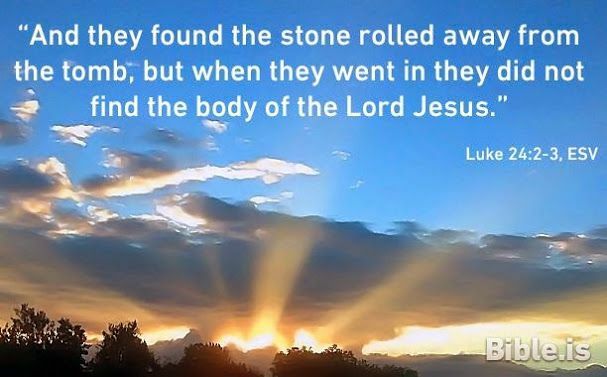 They saw his lifeless body taken down from the cross, and many followed the procession to where His body was laid to rest in a tomb, the entrance sealed by a heavy stone and guarded by fierce Roman soldiers. And on the third day after the crucifixion, just as the ancient prophecies had declared, when the women went to the tomb to anoint His body with spices, they were were quite surprised! And an angel was there as well, to remind them, “He is not here, for he has risen, as he said.” (Matthew 28:6). No, it’s not about the bunnies. They’re cute and cuddly. But the true Easter story isn’t cute and cuddly. It’s real, and it’s brutal. But it’s also the greatest love story that ever took place. Note: I was brought up on the Easter Bunny as well as Santa Claus, and I think I turned out OK. As far as I’m concerned, as long as you also teach your kids the true story behind these holidays, let them enjoy these children’s traditions while they can, because being a child doesn’t last that long!